Sue Groth centers her research on the study of obesity and the behavioral, genetic, and environmental factors that contribute to this complex disease. Specifically, Groth is interested in weight gain among pregnant women and the long-term effects of that weight on both mothers and their children. The overall goal of Groth’s research is to develop interventions to prevent excessive weight gain during pregnancy. She has used focus groups to gain an understanding of how pregnant African American women view weight gain, physical activity, and diet, and has studied the effect of genetic variations on weight gain. 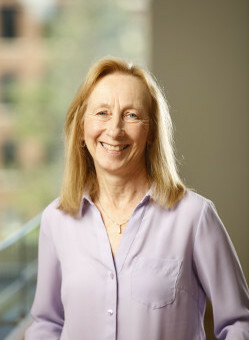 Her research has been funded by national organizations such as the National Institute of Nursing Research, and she served as a co-investigator on a project funded by the National Heart, Lung, and Blood Institute that explored the use of electronic technology to promote healthy pregnancies among women. Groth’s work is informed by her 25-year career as a women’s health care practitioner, primarily caring for low-income underserved women and teens. "As a nurse scientist my goal is to improve the health of individuals, particularly as it relates to obesity. Obesity is a complex disease that is the result of genetic and environmental components. My research is focused on behavioral, genetic and environmental factors that contribute to obesity. As a women's health nurse practitioner my particular interest is the weight that women gain during childbearing and the long-term effects of that weight gain on both mothers and their children. The examination of gene x environment interactions is central to my research. My interest in the problem of obesity stems from years of practice where women frequently lamented that they gained weight when they had their children and then never lost it." e-Moms Roc: A Healthy Lifestyle Intervention for Pregnant and Postpartum Women Using Electronic Media. Pregnancy weight gain and body mass index 5 years later. Steinl, G. K., Whisner, C. M., Pressman, E. K., Cooper, E. M., Groth, S. W., & O’Brien, K. O (2018). Patterns and Correlates of Self-Reported Physical Activity in a Cohort of Racially Diverse Pregnant Adolescents. Journal of Pediatric and Adolescent Gynecology. PMID: 30223025 DOI: https://doi.org/10.1016/j.jpag.2018.09.003. Meng, Y., Groth, S. W., Stewart, P., & Smith, J. A (2018). An exploration of the determinants of gestational weight gain in African American women: Genetic factors and energy expenditure. Biological Research for Nursing, 20 (2), 118-125. Meng Y., & Groth S. W. (2017). Fathers count: The impact of paternal risk factors on birth outcomes. Maternal and Child Health Journal. Groth, S.W. ; Holland, ML. ; Smith, JA. ; Meng, Y.; Kitzman, H. (2017). Effects of Gestational Weight Gain and Prepregnancy Body Mass Index in Adolescent Mothers on Weight and Body Mass Index of Adolescent Offspring. Journal of Adolescent Health. Meng Y, Groth S, Quinn J, Bisognano J, Wu T (2017). An Exploration of Gene-Gene Interactions and Their Effects on Hypertension. International Journal of Genomics, 2017, Article ID 7208318. Groth, SW; Stewart, PA; Ossip, DJ. ; Block, RC. ; Wixom, N; Fernandez, ID (2017). Micronutrient Intake is Inadequate for a Sample of Pregnant African-American Women. Journal of the Academy of Nutrition and Dietetics, 117 (4), 589-598. Meng, Ying; Groth, Susan; Stewart, Patricia (2017). Determinants of gestational weight gain: The impact of diet, genes, and energy expenditure. FASEB JOURNAL, 31 (1), Ib304. Dye, TDV., Li, D., Demment, M., Groth, S., Fernandez, ID., Dozier, A., Chang, J (2016). Sociocultural variation in attitudes toward use of genetic information and participation in genetic research by race in the United States: Implications for precision medicine. Journal of the American Medical Informatics Association, 1-5. Groth, S. W. Dozier, A. Demment, M. Li, D. Fernandez, I. D. Chang, J. Dye, T. (2016). Participation in Genetic Research: Amazon's Mechanical Turk Workforce in the United States and India. , 19 (6), 325-335. Fernandez ID, Groth SW, Reschke JE, Graham ML, Strawderman M, Olson CM (2015). Electronically-Mediated Weight Interventions for Pregnant and Postpartum Women. Study Design and Baseline Characteristics. Contemporary Clinical Trials. Tantillo, M, McGraw, JS, Hauenstein, EJ, & Groth, SW (2015). Partnering with patients and families to develop an innovative Multifamily Therapy Group treatment for adults with Anorexia Nervosa. Advances in Eating Disorders: Theory, Research and Practice. Groth, SW & Morrison-Beedy D (2015). GNB3 and FTO Polymorphisms and Pregnancy Weight Gain in Black Women. Biological Research for Nursing, 17 (4), 405-12. Holland, ML, Groth SW. , Kitzman H (2015). Gestational Weight Gain and Health Outcomes 18 Years Later in Urban Black Women. Maternal and Child Health Journal, 19 (10), 2261-71. Groth SW, Rhee H, Kitzman H (2015). Relationships among obesity, physical activity and sedentary behavior in young adolescents with and without lifetime asthma. J Asthma., 19, 1-6. Robertson Blackmore, E, Groth, S, Chen, D, Gilchrist, M, O'Connor, TG (2014). Depressive symptoms and proinflammatory cytokines across the perinatal period in African American women. Journal of Psychosomatic Obstetrics and Gynecology, 35 (1), 8-15. Groth, SW, Morrison-Beedy, D (2013). Low-income, Pregnant African American Women's Views on Physical Activity and Diet. Journal of Midwifery and Women's Health, 58 (2), 195-202. Groth, S.W., Morrison-Beedy, D., & Meng, Y. (2012). How Pregnant African-American Women View Pregnancy Weight Gain.. JOGNN, 41, 798-808. Groth, SW & Morrison-Beedy, D. (2011). Obesity risk in urban adolescents:. Journal of the New York State Nurses Association..
Groth, S.W., Norsen, L., & Kitzman, H. (2010). Long-term outcomes of advanced practice nursing. In M. D. Mezey., D. o. McGivern., E.M. Sullivan-Marx., & S. A. Greenberg (Eds. ), Nurse practitioners: The evolution and future of advanced practice (5th ed.). New Springer. Groth, S.W. (2010). Honorarium or coercion: Use of incentives for participations in clinical research.. The Journal of the New York Nurses Association. Spring/Summer, 11-13. Groth, S.W. (2010). Adiponectin and polycystic ovary syndrome.. Biological Research for Nursing. Groth, S. W. & Kearney, M. H. (2009). Diverse Women's Beliefs about Weight Gain in Pregnancy. Journal of Midwifery and Women's Health, 54, 452-457. Groth, SW. David, T (2008). New mothers' views of exercise and weight. MCN The American Journal of Maternal Child Nursing, 33 (6), 364-370. Groth, SW (2008). The long term impact of adolescent gestational weight gain. RINAH, 31, 108-118. Groth, S (2007). Are the institute of medicine recommendations for gestational weight gain appropriate for adolescents?. JOGNN, 36, 21-27. Groth, S (2006). Adolescent gestational weight gain: Does it contribute to obesity?. MCN The American Journal of Maternal/Child Nursing, 31 (2), 101-105. Kitzman, H., & Groth, S (2003). Long-term outcomes of advanced practice nursing. Nurse practitioners: Evolution of advanced practice. Ryan, S., D'Aoust, R., Groth, S., McGee, K., & Small, L. (1997). A faculty on the move into the community. Nursing and Health Care Perspectives, 18 (3), 138-141, 149..
Hill, D., Hinton-Walker, P., Groth, S., Chevalier, N., & Springer, A., (1995). Adolescent care: Community-based faculty practice in a nursing center. Nursing Centers: The Time Is Now.